Wealth is everywhere distributed far more unequally than income. After all, wealth is the value of assets accumulated over time, not the paychecks received. Many younger adults have decently high incomes, but once their debts are taken into account, they have little wealth. Many retirees have decently high wealth, but since they are no longer on the job, their income is low. That said, inequalities of wealth around the world are quite remarkable. The Credit Suisse Global Wealth Report 2014, put together by a group at Credit Suisse in collaboration with outside economists Anthony Shorrocks and Jim Davies, documents many of the patterns and trends. As a starting point, global wealth including financial and real estate assets by their calculation adds up to $263 trillion; for comparison, the world GDP was about $75 trillion in 2013. Unsurprisingly, the bulk of this wealth is in North American and Europe. Still, the differences in wealth per adult are striking: $340,000 wealth/adult in North America, $145,000 in wealth/adult in Europe, roughly $22,000 in wealth/adult in Latin America and in China, and about $5,000 in wealth/adult in Africa and India. 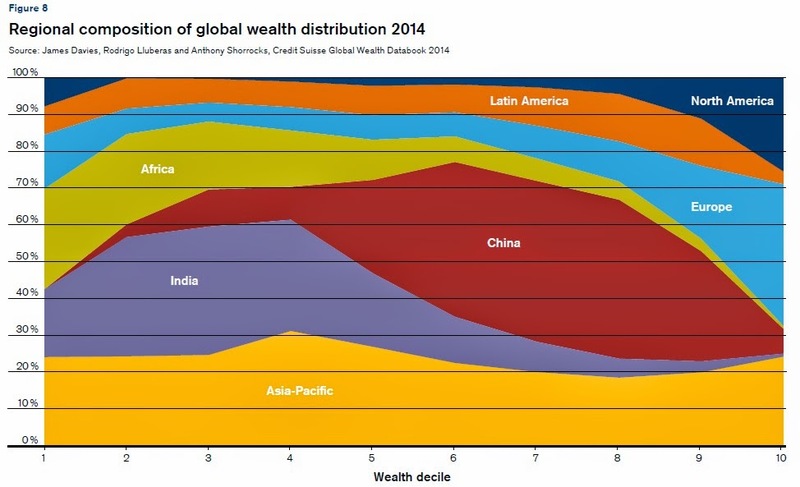 What about if we look at the distribution of wealth across the world? The report notes: "Our estimates for mid-2014 indicate that once debts have been subtracted, a person needs only USD 3,650 to be among the wealthiest half of world citizens. However, more than USD 77,000 is required to be a member of the top 10% of global wealth holders, and USD 798,000 to belong to the top 1%. Taken together, the bottom half of the global population own less than 1% of total wealth. In sharp contrast, the richest decile hold 87% of the world’s wealth, and the top percentile alone account for 48.2% of global assets." It's would be unwise to overinterpret what's shown on the left-hand side of this graph. Since you need $3,650 in wealth to be in the upper half of the world distribution, the lower half of the distribution is showing relatively small differences in wealth, much of it from countries that don't have especially good data. That said, the figure shows some interesting patterns: for example, the red blob of China's population at about the 6th to 9th decile of wealth is striking, as is the purple blob of India's population at below-median wealth. 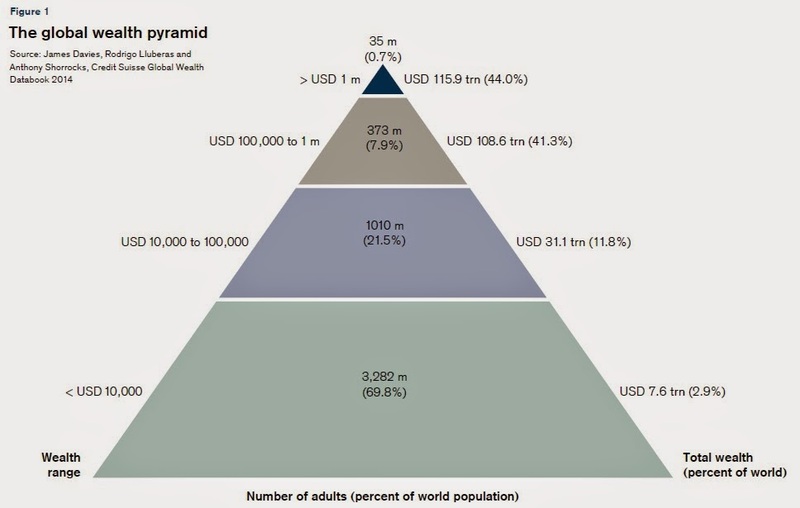 Here's a pyramid of world wealth, showing that about 35 million people who hold more than $1 million in wealth account for 0.7% of the world population and 44% of global wealth. Unsurprisingly, given the earlier statistics, Americans make up by far the single largest nationality in this group. An middle-class American household that puts 10-15% of earnings into a retirement account every year, and which also buys a house and pays off the mortgage, is likely to qualify for being in the top 1% of world wealth by retirement. 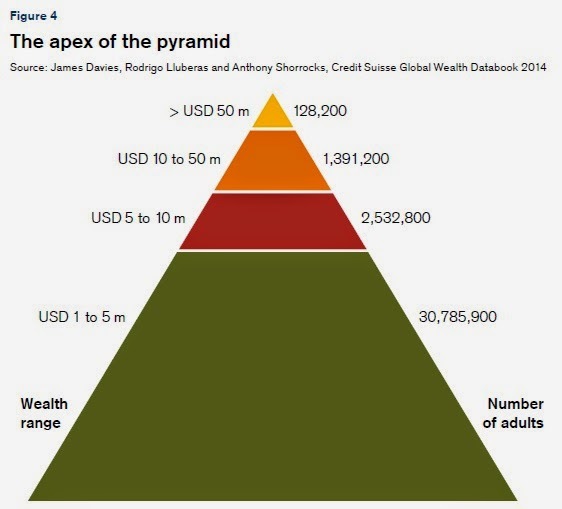 And here's a close-up of the very top of the wealth pyramid: that is, the estimated 128,200 adults around the world who have more than $50 million in wealth. What is the trend of of wealth inequality over time? Income inequality is rising in many countries, but while inequalities of income can translate into inequalities of wealth over time, these patterns need not move in lockstep. If those with high incomes spend their money rather than save it, or accumulate some wealth and then split it up among children and charities, then a rising inequality of income can coexist with relatively little rise in the inequality of wealth. Here are the patterns of income and wealth inequality for the U.S. since 1910. 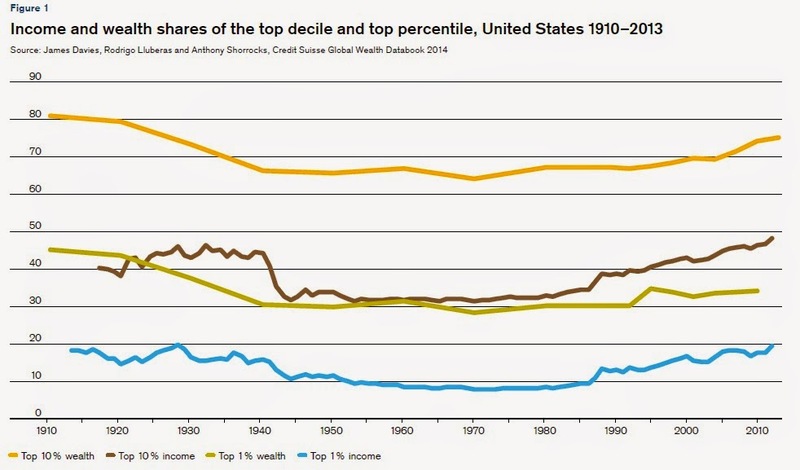 The bottom blue line, for example, shows the share of total income going to those in the upper 1% of the annual distribution of income, and as has been documented many times, this share has doubled since the late 1970s. However, the share of wealth held by the top 1%, shown by the green-ish line second from the bottom, has risen only a small amount. At least for the U.S., at the very tip-top of the wealth distribution, the concentration of wealth is not matching the rising concentration of income. The brown and yellow lines show income and wealth held by the top 10%. Most of the rise in inequality of incomes is happening in the top 1% of the income distribution, but most of the rise in the inequality of wealth is happening not in the top 1%, but in the 90-99th percentiles. Many countries of the world have seen a rise in wealth held by the top 10% of the income distribution in recent years that is larger than the rise in the U.S. economy. Here's a list of countries ranked by how much the share of wealth held by the top 10% has risen from 2000-2014, with China, Egypt, Hong Kong, Turkey, Korea, Argentina, India, and Russia at the top. Part of the issue here, of course, is that inequality of wealth in the U.S. economy was already fairly high, so it didn't have as much room to rise. Part of the reason is that economic growth is often unevenly distributed across a country like China or Korea, so when growth hits the inequality of wealth rises at least for a time. Another issue is that when countries have a combination of political turmoil and corruption, the economic suffering of the middle class makes the share of the wealth held by the top 10% look larger. Over longer periods, wealth inequality is influenced by economic growth, demographics, savings behavior, landholding, inheritance and government policy. Fast economic growth, for example, is expected to lead to the rapid rise of new businesses, raising inequality. 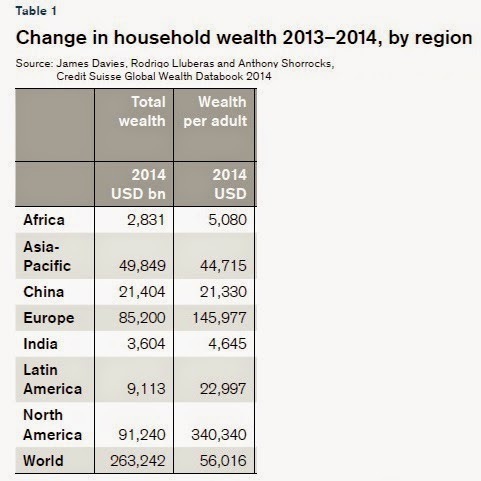 This may account in part for the high level of wealth inequality evident in emerging market economies. Patterns of landholding and the transmission of land from generation to generation is an important consideration in developing countries, while inheritance more generally will tend to support higher levels of inequality, especially in slower growth economies. Governments can influence the level and distribution of wealth in many ways. Higher levels of taxation – on income, capital, property or inheritance – are all expected to reduce inequality in the longer run, although the repercussions on personal incentives are widely debated. Encouraging wealth creation through tax advantages given to retirement savings programs is less controversial and will tend to reduce inequality. Welfare state policies, including public pensions, help to reduce income inequality; somewhat perversely, however, they reduce the need for lower and middle income families to save, lowering their wealth and tending to raise wealth inequality.